On day three of the Marc Hanson workshop we went to Buckingham Park in Left Hand canyon, beautiful stream and lovely foothills. We were to work on maintaining our "concept" for the piece all through the painting process. I understand that better now than I did yesterday when I painted this. Any guesses as to my original concept (what grabbed me about the scene)? The highlight of the day was a pastel demo by Marc, simply amazing. This has been my favorite exercise so far at the Marc Hanson workshop. The idea was to paint a simplified three value study (upper left), then do the same thing again, but continue with a few half-tones and dark and light accents (upper right). I found that the simplification showed up flaws in my design, and I was able to correct them. The next step was to mix colors for the three values, and for this scene we mixed two colors of the mid value (the blue and the lighter green). This is what I wanted to learn, how to mix the color with the right value. And Marc showed us a trick; put a dot of your color on the value painting, squint, and you can see if it is too dark or light. It really works, can you see my color dots on the upper left painting? I got so much out if this exercise, I'd like to include it in my process for a while. You've got to work fast though, to do a value study and color study before the light changes. I'm in Longmont, CO, attending a superb workshop with Marc Hanson. On Monday we did value studies, and enjoyed two excellent demos. Today we worked on taking the values to color, and I loved it. I'll post those results tomorrow. If you want to get more of a flavor for Marc's workshops, take a look at his facebook page, there are some good photos. Yesterday I went back to Cozy Harbor and finished the lobster boat painting. I can see a few things I might fix before putting it into a frame, but I've got the feeling that I was looking for. I'm off on Sunday to Colorado for a workshop with Marc Hanson. I'm looking forward to that! 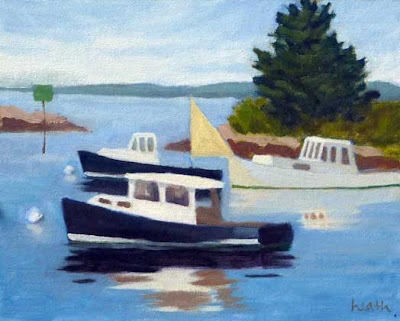 I found a wonderful harbor for those of you who like to paint boats. Susan Henry recommended it to me and it's just beautiful, a Maine classic. Called Cosy Harbor, it's on Southport Island just outside of Boothbay Harbor. There is a new large pier, shared by the town, the yacht club, and Oliver's restaurant, where I enjoyed my lunch. It's busy there once Oliver's opens at 11:30, but earlier it's quiet, and there are some lovely lobster and pleasure boats. I've got more work to do (or should I say undo?) on this painting. The picture was taken fairly early in today's session. Thanks to Haidee-Jo Summers for telling me how to post this via email! Suzanne and I were back at Bunganuc this afternoon, or the corner of Bunganuc and Macouit Roads to be exact. 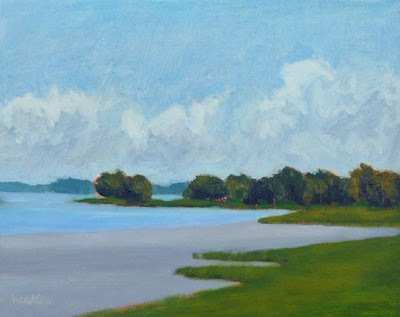 A local explained that Bunganuc itself is where the creek of that name enters the bay, to the right in the painting. I stared this one two weeks ago, but didn't get quite done, so back this afternoon when the tide and sun were the same to finish it up. There's a wonderful tree to stand under, but today it was dropping bugs like mad. I got one in my shirt and was literally hopping up and down trying to get it out. Creepy. We've had some nice plein air painting days, but also some rain, today it was pouring. 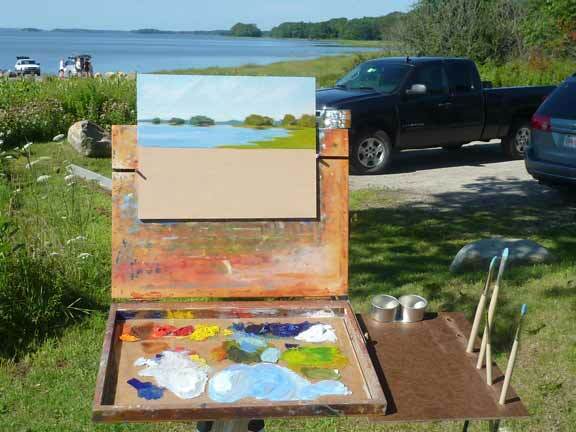 I did this painting last Sunday morning, a little north of Freeport along the coast, at a place called Bunganuc. A new favorite, and not just with me, as you can see above.